Our hair grows from follicles located under the skin and has two main parts. Part of the hair that remains under the skin inside the follicle is referred to as the root while the part that protrudes to the surface (head, arms etc) is known as the shaft. The base of the root (hair root) is referred to as the hair bulb and is the part through which the base of the hair receives nutrients for the formation of new cells. As the base takes in nutrients, new cells are formed and move up the root to become part of the shaft. Over time, these cells also undergo a process referred to as keratinization (maturation process) where they lose their nucleus and fill with a fibrous protein. Therefore, hair can simply be described as strands of keratinized protein. Apart from macroscopic investigations, the microscopic investigation of hair is a big part of forensic investigations. However students can use a microscope to observe and study the characteristics of a hair fiber/strand including pigmentation, scales as well as the pattern of the medulla. A stereo microscope is typically used for the initial examination of hair (mounted and unmounted) before moving on to the compound microscope. This is because a stereo microscope has been shown to be particularly ideal for viewing such characteristics as color, shape, texture and length of hair, which are the eternal characteristics. 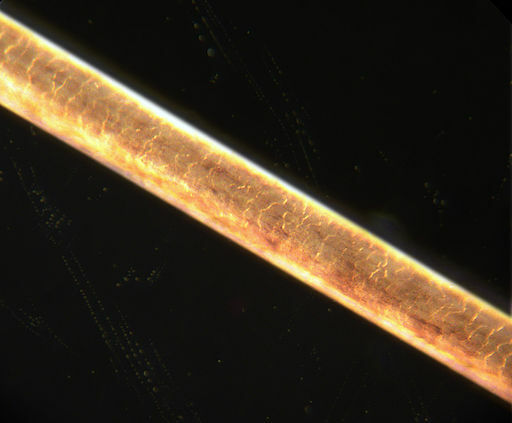 Under the stereo microscope, students will be able to see the hair structure as a strand that may appear to have tiny fibers or fragments on its surface. The stereo microscope will not only show the shape of the hair (twisted etc) and such fragments on its surface, but also the color of the hair strand. When viewing different types of hair, students will also be able to differentiate the thickness between different strands. There are several procedures that can be used to view different structures of the hair. This procedure is used for the purposes of viewing the scale cast of hair strands. Here, the nail polish/latex is used to attach and retain the scale cast that remains on the slide once the hair strands are pulled off. It is worth noting that the purpose of this procedure is not to view the internal structure of the hair strand, but the outer layer of hair that contain the scales. 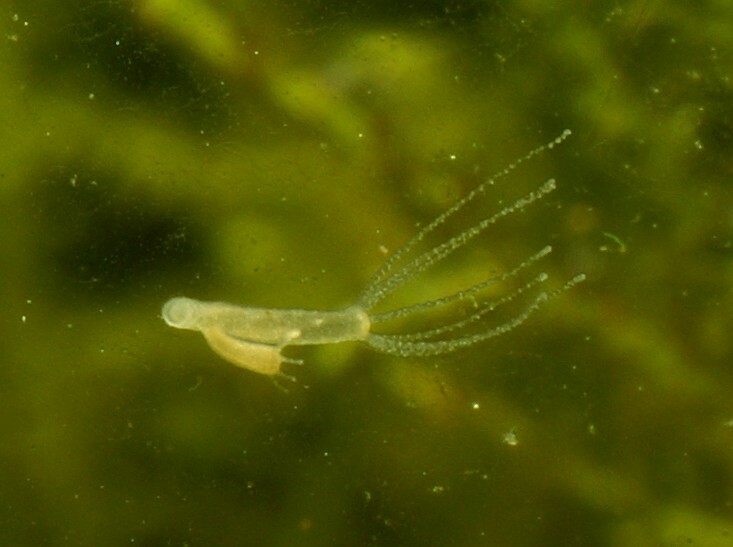 Once the hair strands are pulled off, the scales remain attached onto the slide and can be viewed using lower power objectives. Using this procedure, students have the opportunity to view different types of hairs and get to differentiate the characteristics of the scales. This is a whole mount procedure that involves viewing the hair strand in order to observe and study the medulla. The medulla is not always present and may not be seen in some hair. When carrying out whole mount, students will have the opportunity to compare different hair strands, study the characteristics of the medulla (fragmented, continuous etc) and determine whether it is missing altogether. Under the compound microscope, students will view scales on the surface as irregular annular patterns which tend to be different in appearance when compared with that of animal hair. On the other hand, a whole mount will show the medulla part of the hair as either broken (fragmented), continuous or absent. Observing hair under the microscope (both stereo and compound microscope) can be and easy, fun activity for students. The students get an opportunity to view and study different types of hair and be in a position to identify hair based on its structure. For instance, through experience, a student will be able to differentiate between human and animal hair as well as determine whether given hair is healthy or mistreated. Related: Spider Web Under the Microscope, Cheek Cells Under the Microscope and Sugar Crystals too. Bisbing, R. E. Forensic identification and association of human hair. In: Forensic Science Handbook. Vol. 1, 2nd ed., R. Saferstein, ed. Pearson Education, Upper Saddle River, New Jersey, 2002. Leon Augustus Hausman, and Cornell University. Human Hair Under the Microscope Recent Acquisitions to the Knowledge of Its Minute Structure, and Their Applications. 1922.